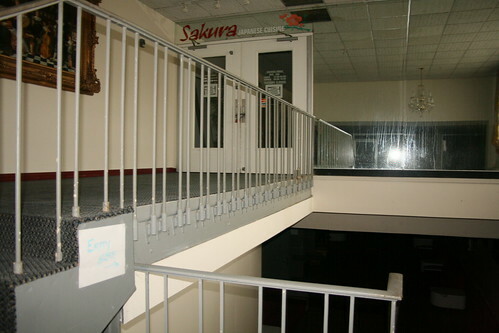 In an effort to diversify the business offerings at the hotel, there were multiple retail outlets, including a gift shop, and a Japanese restaurant, seen here. Unfortunately, this door was locked when I was here this time, but in a future visit, we did manage to open the doors. A sign on the stairwell guides maintenance staff to drip buckets. The sign reads, "empty here" and has an arrow pointing to the next sign, which then points to the bucket itself.